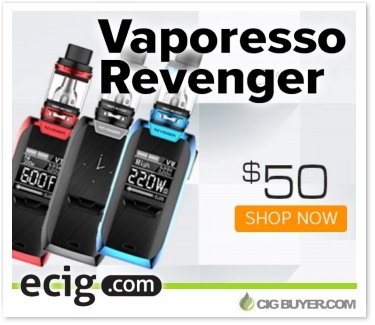 Vaporesso Revenger 220W Kit Deal – ONLY $50.00! If you’ve been thinking about picking up the new Vaporesso Revenger 220W Kit, you won’t find a better deal than this! US supplier Ecig.com has an unbeatable price of just $50.00! The Vaporesso Revenger Mod is a beautifully designed device with a huge 0.96 inch OLED display, real-time clock and an In-Mould Labeling (IML) case for greater resistance to wear and improved graphic quality. The OMNI Board 2.0 chipset offers up to 220W of output with precision temperature control and TCR, CCT and CCW adjustments. It comes with the 5ml Vaporesso NRG Sub-Ohm Tank, featuring innovative GT Cores that come in traditional and CCELL Ceramic formats at various ohm ratings. * Expiration of this special deal is unknown. Good while supplies last.